Tempered glass construction is safer than annealed glass! Showcases ship unassembled to save you hundreds! Sliding rear doors allow easy access to displayed merchandise! 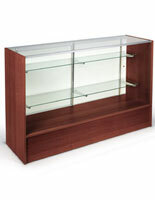 These showcases may be just what your retail store needs! 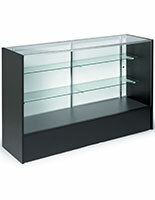 The 6' long showcases are affordably priced counter-style display cabinets, perfect for any number of retail environments. 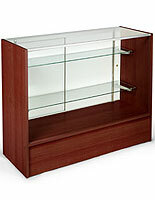 Use the showcases for jewelry in a jewelry store, watches, handbags or perfume in a department store, candy in a movie theater, souvenirs in a gift shop, or fine china, glassware or vases in a home décor store. The possibilities are endless with these showcases. 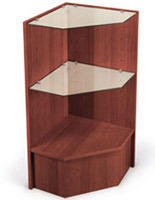 The display cabinets, showcases feature a rich, cherry finish, sure to add a touch of upscale elegance to any location. 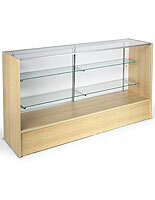 Although the showcases look expensive, you'll be pleased to learn they are, in fact, very affordable showcases. 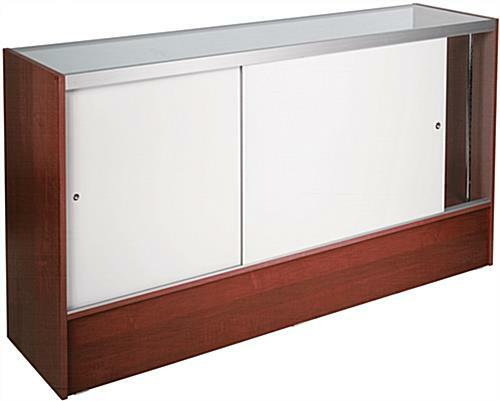 Because the showcases are crafted from melamine rather than real wood, they are very budget-friendly showcases. Melamine is a common alternative to wood, able to stand up to high-traffic environments, and giving the appearance of real wood. The showcases also feature tempered glass, which is a much safer and more durable alternative to traditional plate glass. 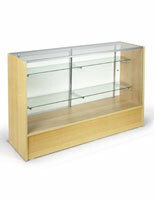 This tempered glass will shatter into small, manageable pieces if broken, rather than large, dangerous shards. Anodized aluminum extrusions provide more stability than the plastic extrusions included with many other showcases. These showcases, also known as glass displays, also feature rear sliding doors to allow store associates easy access to displayed items. 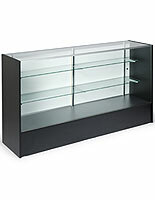 You'll save hundreds by buying these unassembled showcases. 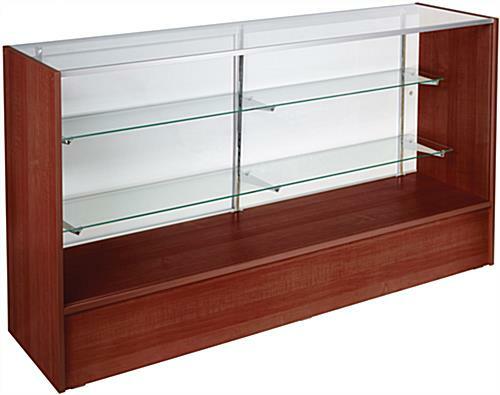 Unlike the assembled glass displays or showcases, warehouse assembly and large freight shipping costs are not factored into the price you will pay for these showcases. Assembly is simple, although it does require 2 people. We have even created a step-by-step video outlining the procedure for completely assembling these beautiful cherry showcases. Exactly as described and very easy to assemble. The only thing, it was missing the rubber non-slip attachments for the shelf brackets. No worries, we did a chat session with support and they're suppose to be sending them along for all our cabinets which are missing them. Hi PJ! Thank you so much for taking the time to write this review. We're so happy that our retail counter met your expectations and was easy-to-assemble. We apologize that your order arrived without the rubber non-slip attachments, but we're glad that our support team was able to provide a quick and easy solution. Thanks again! An excellent Item, easily assembled with a minimal amount of tools required.